Galahad and I are going back to school in a couple of weeks—the fall session of Carolyn Resnick’s online Waterhole Rituals course is starting up the week of the 22nd. I’m excited to have a chance to take it again—we learned so much from the spring session. Galahad and I are very different together now. We have a much stronger bond these days, and he is feeling free to be himself. One of the many changes that I love is the fact that we have “conversations” about interesting things going on, and that we listen to each other. Here’s a link with couple of little instances of what I’m talking about. This never happened before we started studying with Carolyn. I had no idea it COULD happen. 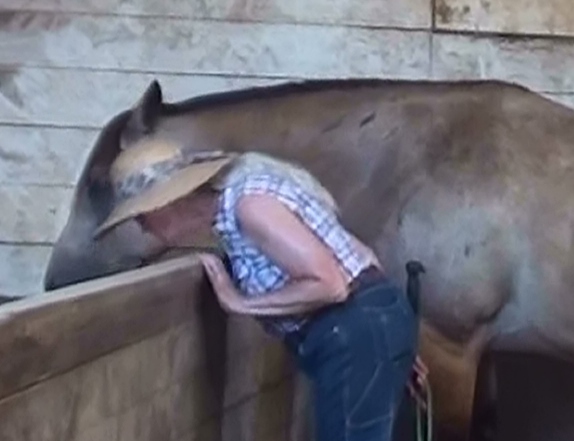 It’s not an easy thing to learn to be with a horse in that way. In Carolyn’s world, the horse has the right to choose not to do an activity. Instead of trying to make it happen, we’re taught to go back to something the horse enjoys, and stick with that until he’s ready to do the other thing. That could be minutes, days, or months. When Galahad and I started the class last March, Carolyn could see right away how shut down he was, and “prescribed” lots of just spending time together, hanging out in the pasture or the paddock. And that’s mainly what we’ve done all summer—which was fine with both of us, since neither Galahad nor I deal with heat very well. We did continue a little bit of work on the halter, just to keep his ground manners tuned up. Our rule is that when the halter is on, he plays by Natural Horsemanship rules. He’s very, very good at that, so that worked out fine. When he’s at liberty in the pasture or arena, though, he gets to say no if he wants to. As long as he respects my boundaries so that I can be safe, he can do something when I ask him to, or he can choose not to do it. That’s the rule in liberty work. This has been interesting for us both, but especially for me. As with so many things, it’s easier to learn something the first time than to un-learn something you’ve practiced. The hardest thing for me to re-learn is to be OK when I ask for something and Galahad says no. My knee-jerk, conditioned response is still to MAKE him do it, or at least to get him to do SOMETHING, even some small thing like yield his hindquarters, so that I can “end on a good note”—i.e., so that I can WIN. That’s the Natural Horsemanship way (and in that context, it’s fine), and more than that, it’s the dominance-based paradigm that I learned from my dad. Sixty-two years of practice one way, and now I’m asking for a complete change in six months? Um, Kay, relax. You have time to learn this! Don’t be so hard on yourself. On the other hand, over this same period of time I’ve found that my boundaries are much stronger with him. I don’t even blink when he’s being a pest and I wish he’d quit—I just send him off. And he goes, much more willingly than he used to, and without taking offense. He still watches me, and is just as happy to come back when I’m ready. So this fall’s class will be interesting, as I learn more about myself. My horse, my teacher…. I’m really glad to have found Carolyn, who can help mediate this learning.